Ministère de la Santé et des Services sociaux, in collaboration with Institut national de santé publique du Québec and Bureau du coroner du Québec, wishes to set up a province-wide toxicovigilance program. To assess the feasibility of such a program, a review of the grey and scientific literature was conducted. The review was carried out in summer 2017 to identify examples of toxicovigilance activities based on toxicological analysis data collected by coroners and medical examiners on deceased persons before formal determination of the cause of death. The results of the literature review are presented in a related publication (Vachon, 2018). To identify unpublished toxicovigilance activities, the study directly surveyed coroners and chief medical examiners in Canada, as well as coroners’ offices and public health organizations around the world. 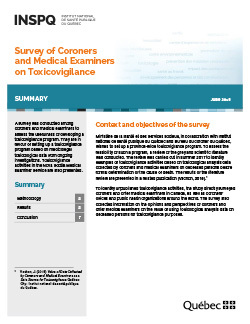 The survey also collected information on the opinions and perspectives of coroners and chief medical examiners on the value of using toxicological analysis data on deceased persons for toxicovigilance purposes.